Blissta Presents Beautifully designed Banarasi Silk Un-stitched Straight Salwar Suit With Fancy Border at The Bottom Of Top Fabric Containing Moti Work Lace. It Is Available In Free Size And Can Be Stitched To Suit Your Measurements. It Is Alterable Up To Chest Size Of 42;Comes With Contrast Color Chanderi Silk Embroidery Work Dupatta Having Fancy Tussels & Santoon Un-stitched Bottom. 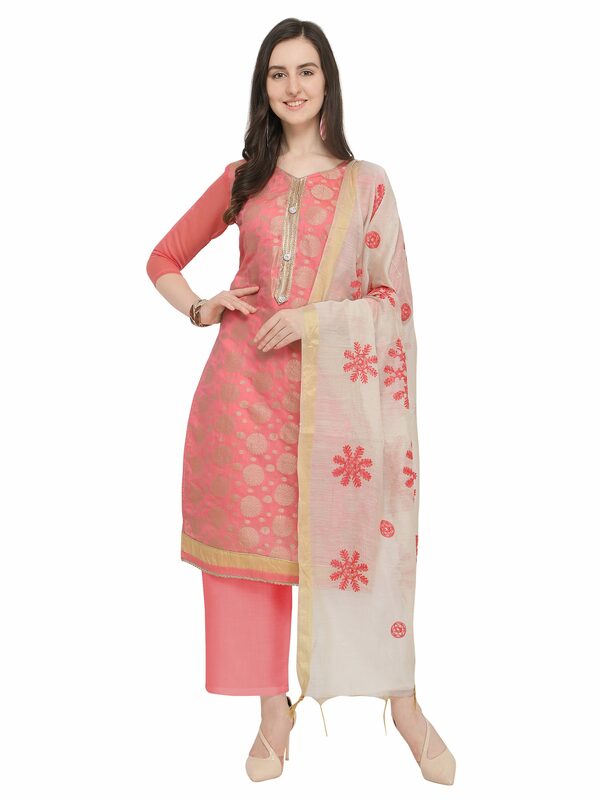 Bottom Fabric Will Be Stitched As Churidar As Well As Plazzo As Per Your Choice & Attitude. This Dress Would Add Elegance To Your Look. Wear It At Any Occasion By Pairing It With Matching Ethnic Jewelary Like Ethnic Jumkas And Ethnic Footwear Like Mojaris and Juties To Get Complete Ethnic As Well As Fab Festive Look & Get Complimented For Your Impressive Choice.